I always say one of the best things we can do to reduce our burden on the environment is BE LAZY! By which I mean, eliminate work that isn’t productive – stop doing things that shouldn’t be done in the first place. 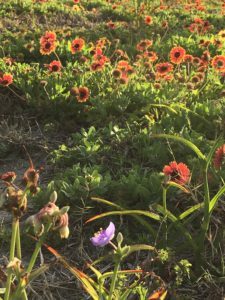 One of the best things you can do for the environment, while also saving yourself a bunch of time, money, and energy, is allow all or part of your yard to exist as prairie or meadow. 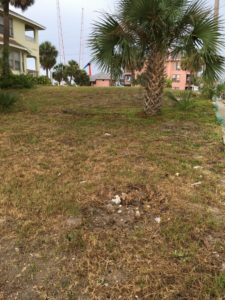 Here, a lot in my neighborhood that had reverted to natural dune vegetation. Unfortunately, after existing in this meadow state for a long time, the lot was finally mowed very short (perhaps in response to someone complaining about “weeds”). Now the mowing will probably continue and if it does, the grass will take over and the flowers won’t have a chance to grow back. First photo shows what the meadow used to look like when undisturbed by mowing. The flowers only grow to a certain length and are self-maintaining. Contrast with the photo showing the field after it was scalped. – Save time and money by reducing mowing & irrigation (or eliminating them entirely)! If you want to help the planet while freeing up time and energy for the things you love in life, consider allowing all or part of your lawn to revert to meadow. Next PostNext Appropriate Technology: What’s “Appropriate”?